Relax and Awaken Weekend in being held in a warm and inviting guest house in the beautiful quiet village of Blackheath, Blue Mountains, NSW. It will be wonderful! Take a break from busy life to stop and connect with your surroundings, to breathe in the fresh Mountain air and to explore new ways of being and experiencing life. This will be magical time to step away from the daily routine to restore and rejuvenate. A perfect opportunity to open your awareness to your greater self, in a whole new way. Imagine relaxing with breath work or learning how to balance your thinking that will help you achieve better results in all areas of your life. Meditate in a relaxing safe pace and take a mindful bush walk, connecting to nature in a whole new way. De-stress in a warm welcoming environment. Gain a Deepened awareness of yourself. Walk and wonder on a pretty and breathtaking mountain track. Learn tools to balance life on a daily basis. Experience inner and outer body mind connection. 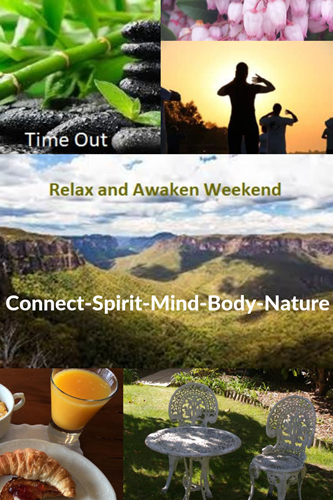 4 hour bush walk interspersed with Qigong, meditation and mindfulness practices, 4 mini workshops on enhancing life experience, learn 4 different meditation practices, Tai Chi sessions and class on understanding the power of Tao Calligraphy. Plus free time to chat and relax. Bring a sense of humour, comfortable layered clothing and sturdy bush walking foot wear, water bottle, hat, sunscreen and long trousers preferred. . Medium grade bush walk. (Note: Vegetarian food is provided, alcohol free is requested, specific dietary requirements are not catered unless advised at time of booking). Mandy Eagle - Based in the Blue Mountains, has 30 years’ experience in teaching the gentle art of Tai Chi, is a qualified Reiki 2 Practitioner and owns hers own business as qualified personal and business coach. Mandy is committed to everyone having the experience of truly understanding themselves; being free to be the best version of themselves and living the life they love. In collaboration, Tina and Mandy bring together their years of experience in personal self-development to connect and transform mind body emotion and spirit with tools to know yourself through breath, movement, thought and visualisation.